Flat metal canopies can make a bold, chic statement about your business! If you’re in the market for a canopy or awning, you know by now that your options may seem endless. But as you do more and more research, you may start to realize the growing popularity of flat metal canopies and aluminum awnings. Why are these popular options? Let Carroll Awning tell you. One of the reasons flat metal canopies and aluminum awnings are so popular is because of the many levels of functionality they offer. One of the obvious purposes a flat metal canopy will serve is keeping patrons of your business dry and protected from rain and excessive wind. It’s already hard enough to get people to leave their homes when the weather is bad, but you don’t want to lose additional business because you couldn’t keep your customers dry! And if you’re a restaurant owner, a canopy can be used to increase your seating options. People don’t want to eat outside if it’s hot, but a nice metal canopy or aluminum awning will have people flocking to you. Find out why your new restaurant needs an awning here. 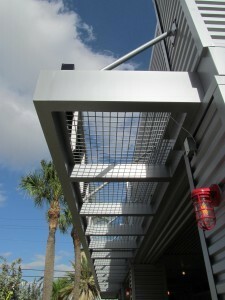 A flat metal canopy can make a bold architectural statement about your business. The business world is more competitive than ever and every detail counts. You may have the best products and services, but you will not gain any new customers unless your business makes a great first impression. If you’re looking for a way to create more buzz around your business and stand out, look no further than metal canopies and metal awnings. Customers will love congregating in front of your store when a nice canopy or awning is provided, and that will boost business. One issue that turns business owners and homeowners off from canopies and awnings is that they don’t want a cookie-cutter look. That isn’t a problem when you order an aluminum awning. The experts at Carroll Awning Company will manufacture your canopy or awning to the exact specifications of your location.